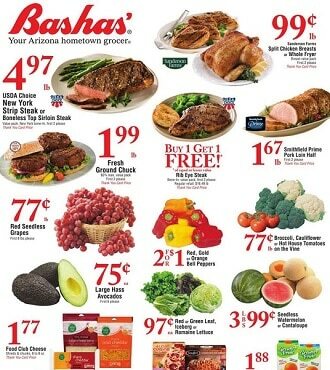 Check out the Bashas’ Ad Sale, valid April 17 – April 23, 2019. Don’t miss the Bashas’ Sale Specials, coupons and grocery deals & promotions from the current Ad Circular. Shop and find savings for USDA Choice Rib Eye Steak, Yellow Peaches or Nectarines, Red Strawberries, Blueberries, Ben & Jerry’s Ice Cream, Bumble Bee Chunk Light Tuna, Full Circle Organic 100% Maple Syrup or Peanut Butter & Jelly, Wisk or All Detergent, Speed Stick Deodorant, Sockeye Salmon Fillets, Organic Red or Green Seedless Grapes. Don’t miss this week Bashas’ Ad deals and don’t forget to print off your coupons before heading out to shop.